﻿On the edge of the Metroplex, find small-town charm and outdoor fun in Grapevine. ﻿﻿﻿﻿﻿﻿﻿﻿﻿﻿The first time I visited Grapevine was in the late ’80s, when I was a TV news reporter in Dallas. I interviewed Mayor Bill Tate about the proposed expansion of D/FW International Airport, which would have paved over the small town’s Main Street. Tate told me they hoped to attract tourists to the area, and I remember thinking that there wasn’t much to see or do in the sleepy little town. Fast-forward a couple of decades. Thanks to visionary leadership from Tate and others, the town’s transformation into a delightful tourist destination seems complete. 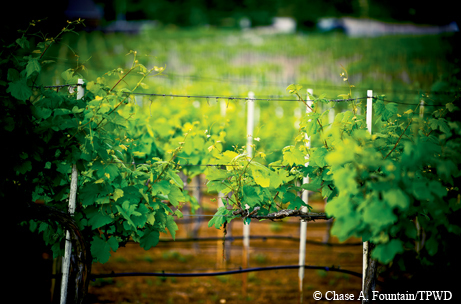 The town has fully embraced its history — and namesake grapevine — to create an identity that centers on all things grape. My sister and I chose a weekend in April for our visit, and we got a taste of all Grapevine has to offer. Our first stop was Bass Pro Shops to buy licenses in preparation for our Friday morning fishing excursion. From there, we headed to our accommodations for the weekend — a lakeside cabin at The Vineyards Campground and Cabins on Lake Grapevine. Operated by the City of Grapevine, the facility is one of the top-rated RV campgrounds in the country. The two-bedroom, two-bath cabin was perfect for us, equipped with every creature comfort we might need. This is my kind of camping! After settling in, we headed to Main Street for a quick walkabout. Grapevine is the oldest settlement in Tarrant County, founded in 1844 after Gen. Sam Houston signed a treaty of “peace, friendship and commerce” with 10 Native American nations. The town was named for the native mustang grapes that are prolific in the area. The settlement that followed quickly grew into a farming and ranching community, bolstered by the arrival of the St. Louis Southwestern railroad in 1888. That spirit of friendship and commerce is alive today in the bustling shops, friendly merchants and lively restaurants that line the charming main boulevard. There are more than 200 restaurants in Grapevine, and for dinner we opted for Winewood, a locally owned upscale eatery with a great menu. When we got back to the campground, we decided we needed a stroll before bed, so we took a walk along the shores of Lake Grapevine. Friday morning dawned early, and we headed to the boat dock to meet Robert and Jan Hensley, a retired Dallas couple. The Hensleys spend every minute they can on the water here. They are not professional guides, but had heard through the grapevine that we were looking to fish this morning and generously offered to take us out. We stopped the boat to try our luck, and Robert cranked up a GPS fish finder. Despite the wonders of technology, no nibbles. Jan noticed a huge flock of gulls and terns circling nearby, a more natural sort of fish finder. She got very excited and urged Robert to move quickly. “She’s doing the fish dance,” Robert laughed as he maneuvered the boat closer. It was a good call. Within a minute or so, I felt a nice jerk and had two on the line. My sister, Tricia, quickly caught up, and the action didn’t stop for quite a while. We caught and released dozens of white (or sand) bass and had an absolute blast. In addition to white bass, Lake Grapevine has thriving populations of largemouth and smallmouth bass and channel catfish. The Texas Parks and Wildlife Department regularly monitors the lake and stocks it with fish. Our next stop was Sea Life Grapevine Aquarium, one of the town’s newer attractions, located at Grapevine Mills Mall. 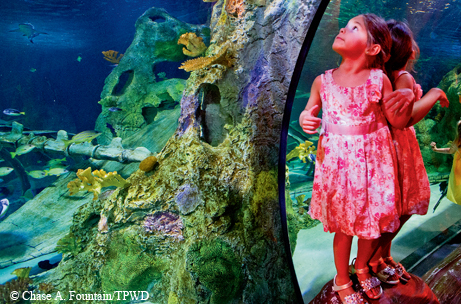 The beautifully designed facility is home to more than 5,000 sea creatures from all over the world. Conservation messages are worked into every exhibit. The 30,000-gallon ocean tank is cleverly constructed to make you feel as though you are actually standing inside the tank, with fish swimming over, under and all around you. The exhibits engage children in interactive play. We saw dozens of children laughing, chattering and crawling through kid-friendly spaces. As we enjoyed a lunch of gourmet sandwiches at the Main Street Bistro and Bakery, we joked that it was probably the first time either of us had visited a mall without doing any shopping. After lunch, we headed to the Botanical Gardens at Heritage Park, where horticulturist Lisa Grove led us on a quick tour of the lovely grounds. Fountains, art and a butterfly garden provided a peaceful and tranquil break in the day. The gardens are open from dawn to dusk 365 days a year. As we walked through the peaceful setting, we saw families picnicking, children laughing and lots of butterflies fluttering. “Those are our favorite visitors — kids and butterflies,” Grove said. From there we headed back to Lake Grapevine, this time for a sail. We met Capt. Bob Leary and first mate Kate at their spotless 35-foot Catalina and sailed off into the afternoon. 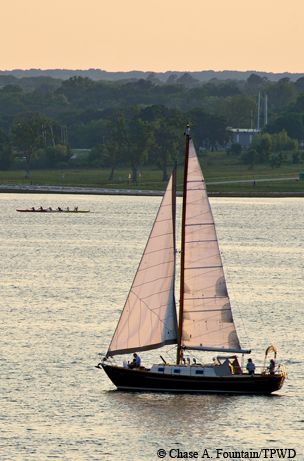 The Learys have been doing charter sails on Lake Grapevine for the past nine years. In a vivid coral blouse and flowing scarf, Kate was a bright spot of color on the pristine boat. The sun streamed down on us, and as the sail filled with wind and moved the boat effortlessly across the lake, we could easily understand why the Learys enjoy spending so much time on the water. We headed back to the cabin for a respite before dinner and met a lovely young family who had driven 400 miles from Louisiana for the weekend so their little boy could see Thomas the Tank Engine, who was making a special appearance at Grapevine’s vintage railroad that weekend. The family had taken the cabin next to ours, and the little boy was clearly delighted. As we relaxed on the deck, we could see another family fishing on the pier and could hear two little girls squealing as they landed a fish. The happy family vibe was contagious. Before dinner, we made a stop at the 9/11 Flight Crew Memorial, which lies in the path of incoming flights to D/FW Airport. Grapevine might seem an odd choice for a memorial to one of America’s worst tragedies, but North Texas is home to American Airlines. The memorial was the brainchild of an American Airlines flight attendant who wanted to honor the very first responders in the disaster — the flight crews of the doomed American and United Airlines flights who perished that terrible day. The focal point is a beautiful yet somber sculpture that depicts five figures: two pilots, two flight attendants and a child, who represents the traveling public. We dined that evening at the Vineyard Steakhouse, another over-the-top dining experience. We ended our evening with a stroll around The Vineyards Campground and Cabins and turned in early. Always an early riser, I left Tricia asleep the next morning while I took a short bike ride around the campground and nearby neighborhood. It was a pleasant way to start the day, and the exercise was healthy penance for the indulgent meals we’d enjoyed the last couple of days. Saturday’s main activity centered on what put Grapevine on the tourist map: celebrating Texas wine. There are many events all year in Grapevine that celebrate the fruit of the vine, including GrapeFest on the third weekend every September and the Blessing of the Vines and New Vintage Wine and Gallery Trail each April. We were invited to be special guests at the 20th annual Blessing of the Vines ceremony, a tradition that honors the new vintages from all Texas wineries. Before the ceremony at the Delaney Vineyards, we spoke with Mayor Tate, and I reminded him of that interview so long ago. Tate has served as mayor for close to 40 years, one of the longest tenures in the history of Texas. He noted that when we did that interview, it was actually illegal to sell wine in Grapevine. Now there are eight winery tasting rooms in town, and wine is the lifeblood of the tourism economy, as was demonstrated by the thousands of tourists in Grapevine that weekend. We were delighted to get to lead the procession through the vineyard, carrying a cross and a statue as dozens of townspeople joined us. The ceremony is reminiscent of a tradition that was brought here when the first vineyards were planted in the 1500s. During an afternoon on the New Vintage Wine and Gallery Trail, we enjoyed meeting members of the Grapevine Wine Pouring Society, who were happily engaged in their favorite activity at wineries in town. These volunteers are ambassadors for Grapevine and were well-versed in the Texas wines they poured for appreciative visitors. Our last outing was a visit to the Texas Star Dinner Theater, where a professional troupe staged a hilarious Wild West murder mystery play, accompanied by a surprisingly good meal. The play was appropriately set in a vineyard, and the performers interacted with the audience in a very engaging way. It was a highly entertaining evening, and the troupe made good on its promise to deliver a play “where historical meets hysterical.” It was a fitting end to a weekend filled with good times, good food and lots of laughter.